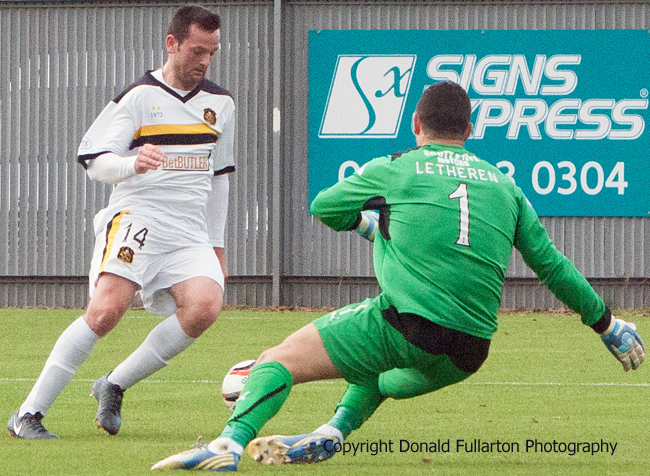 DUMBARTON ended up with a heavy 4-1 defeat at the hands of title challengers Dundee at the Bet Butler Stadium. DUMBARTON ended up with a heavy 4-1 defeat at the hands of title challengers Dundee in a controversial match at the Bet Butler Stadium. A crowd of 1,175 saw Jack Ross in charge of the side as manager Ian Murray began a three game suspension, and midfielders Hugh Murray and Scott Agnew were both sidelined by injuries which could keep them out for several weeks. Sons coped well in the first half with John Brown's full-timers, and Colin Nish, Andy Graham and Aaron Barry all had good chances. However the interval arrived with the scoresheet blank. The second period turned into the Barry Cook show as the card-happy referee had a major influence on the outcome and will not be receiving any Christmas cards from Sons fans. The Championship's top scorer, Peter MacDonald, opened the scoring when his free kick was deflected past keeper Jamie Ewings and into the net for the opener. Then came the turning point when Sons and ex-Dundee striker Colin Nish was given a controversial second yellow card, with a red card following. Ryan Conroy, who hails from Dumbarton, doubled the score with a stunning strike from distance, and then Peter MacDonald made it 3-0 when he converted a penalty. Substitute Garry Fleming pulled one back for the home side when he swerved past the keeper and netted, but shortly before the end Dundee skipper Gavin Rae netted no.4. The picture shows Garry Fleming beating the keeper.